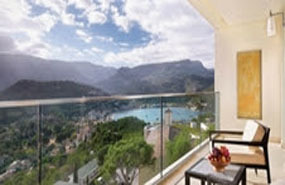 Jumeirah Port Soller Hotel & Spa is their first European resort and boasts breathtaking views overlooking the Port de Sóller. 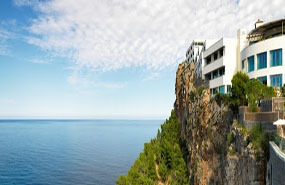 Experience the island of Mallorca from a totally unique and exclusive perspective. Take to the roads with a Harley Davidson motorbike enjoying the astounding scenery. Ride past mountains and ancient olive trees, villages of stone houses surrounded by terraces of orange, lemon and fig trees and navigate the cliffs that drop down to the intense blue of the Mediterranean Sea. Journey to the historic village of Esporlas to begin a magnificent tour combining a moderate hiking route through the renowned ‘Cami des Correus’ trail with a wine tasting at the heart of Banyalbufar. This medieval walking route meanders through the beautiful and ever-changing landscapes of this World Heritage area, rich in historical and iconic scenery. For a culinary masterclass, visit one of Palma’s most popular markets, Santa Catalina, before joining the chefs at Lonja 18 with a hands-on practical experience, affording the perfect opportunity to socialise, have fun and learn the secrets of Mediterranean cooking. Jumeirah Hotels & Resorts blend luxurious comfort with spectacular surroundings and have created this idyllic island resort in the Maldives, suitable for families and couples alike. An array of activities and flawless service await you at Jumeirah Vittaveli. Submerge yourself in the resort’s stunning house reef from the comfort of a semi-submarine. The first of its kind in the Maldives, the semi-submarine will take you on a journey to explore and allows you to enjoy spectacular views of the underwater ecosystem, creating the illusion of a real submarine dive. Available for all villa guests, the complimentary bicycles allow you to explore and discover this magical island resort at your own leisurely pace, taking in the spectacular views around Jumeirah Vittaveli. The resort offers exceptional experiences such as sandbank picnics, sunset cruises and visits to local islands, in addition to cooking classes, mixology masterclasses, eco-friendly golf, fish feeding, family treasure hunts and island walks.